Creamy cheesecake... buttery graham crumb crust... caramel drizzle and a sprinkling of pecans. 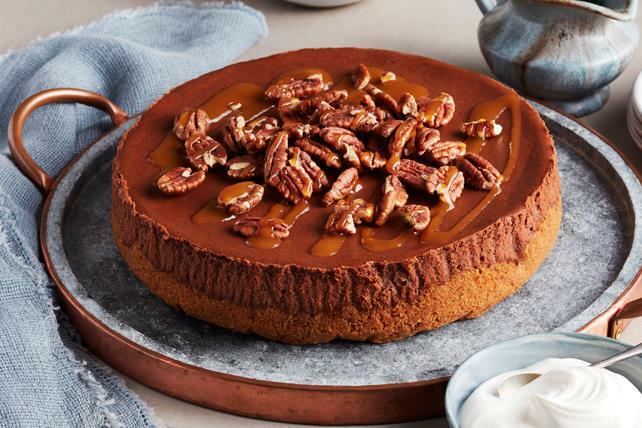 Be sure to save yourself a piece, because this Caramel-Chocolate Cheesecake is going to disappear quickly. This decadent cheesecake is delicious enough to satisfy anyone's sweet tooth. Combine graham crumbs and butter; press onto bottom and 1 inch up side of 9-inch springform pan. Bake 10 min. Meanwhile, finely chop 1/2 cup nuts; set aside. Beat cream cheese and sugar in large bowl with mixer until blended. Add chocolate; mix well. Add eggs, 1 at a time, mixing on low speed after each just until blended. Pour 1/2 cup caramel syrup onto bottom of crust; sprinkle with chopped nuts. Cover with cream cheese batter. Bake 50 min. or until centre is almost set. Run knife around rim of pan to loosen cake; cool before removing rim. Refrigerate cheesecake 4 hours. Garnish with remaining nuts, then drizzle with caramel syrup before serving. If baking this delicious cheesecake in a dark nonstick springform pan, reduce the oven temperature to 325°F and check the cheesecake for doneness after 45 min. This delicious cheesecake can be baked in advance. Cool the cheesecake completely, then wrap it tightly and freeze u to 1 month. Thaw in refrigerator, then top with remaining nuts and caramel syrup just before serving. Enjoy a serving of this indulgent cake on occasion, but keep portion size in mind.